Before filling out your Daily Fantasy Football lineup, here’s the best bets and sleepers for your DFS team. There are some decent matchups, especially with Cam Newton going against Atlanta, but I’ll take Brees in a rebound game of sorts. 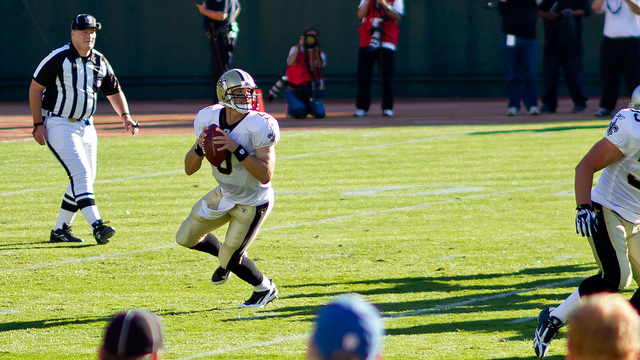 Brees hasn’t been on a successful team, but he’s still a monster for fantasy owners. He has eight touchdowns compared to only one interception and led all quarterbacks in yards after the first three weeks. This defense can’t stop anybody and I expect the Chargers to score at will Sunday against the Saints. That should open up the passing game for Brees, allowing him to try to get New Orleans in the win column. Bortles offers a good price and Indianapolis hasn’t shown the ability to stop the pass this season. The Colts own the sixth-worst pass defense in the NFL, and with the price you can get Bortles, he’s worth a flier as a sleeper. He showed the ability last season to gobble up garbage-time points. The Colts can score on the Jaguars’ defense, so Bortles could be that late-game garbage-time man again in this game for a cheap price. The Houston Texans keep pounding the rock with Miller and have provided fantasy owners with decent yardage. However, Miller has yet to see the end zone this season, but I’m anticipating that streak to stop in this game. The Titans allow 4.3 yards per carry, a below-average number for NFL defenses. Miller has been given plenty of work so far this season and I don’t expect that to change in this game. Expect Miller to garner plenty of volume again and put up some points on the scoreboard. Howard was pretty much the every-down back when starter Jeremy Langford went down for Chicago last week. With injuries at pretty much every position, the Bears will likely look to establish the run early. If Howard can get going, he should have enough volume to be in the conversation as a top-flight running back. The Bears haven’t done much on offense this season, but Detroit is allowing 5.1 yards per carry this season, tied for the worst mark in the NFL. Benjamin went for zero last week. Carolina talked in the postgame about getting him more involved in the gameplan, so I expect him to go wild against Atlanta. You get a discount on him for Daily Fantasy based on him not being a regular at the top of the leaderboard. But he’s worth a flier based on the matchup and Carolina seeking to get him more involved in the game. The Raiders have a terrible defense. Mix in the fact that Oakland has traveled all over the place in the first three weeks, and I love the matchup for the Ravens. Joe Flacco is going to throw the ball and, so far, Smith has been his primary weapon. He doesn’t have a big yardage total, but if he can sneak in a touchdown or two, he has the volume to compete for a top spot as a wide receiver.